Having your finances on autopilot is great, but it’s also important to check them periodically too. Here are 6 year end money moves to ensure success. We’re approaching the end of the year – are you excited? There is nothing like the sound of holiday songs and bells to remind you of those New Year resolutions you set a whopping 11 months ago. In fact, for most people, thinking about retirement, 529 plans and a living will is probably the furthest thing from your mind. Especially when the sales at Kohl’s are knocking at your door. And when presents are stacked up under the tree. Think back to 12 months ago. You may have had resolutions to save more.. invest, start your child’s college fund, streamline your finances, and perhaps scale back. Despite the start, you may feel like things reeled out of control a few months into the year. Even if things did get out of hand early on, and those resolutions didn’t quite make it through until year end, you still have time to make some progress before this next year. There is no better time than now to get stuff done so you can give yourself a mini high-five before the year comes to a close. Having your finances on autopilot is great. So great, in fact, I love doing the same with mine. However, it’s also necessary to spend some time reviewing them periodically too. You want to make sure you are catching things you may have otherwise forgotten about. It’s always best to remember that the less money Uncle Sam gets, the more you have to use to fund your retirement or college funds for your kids. 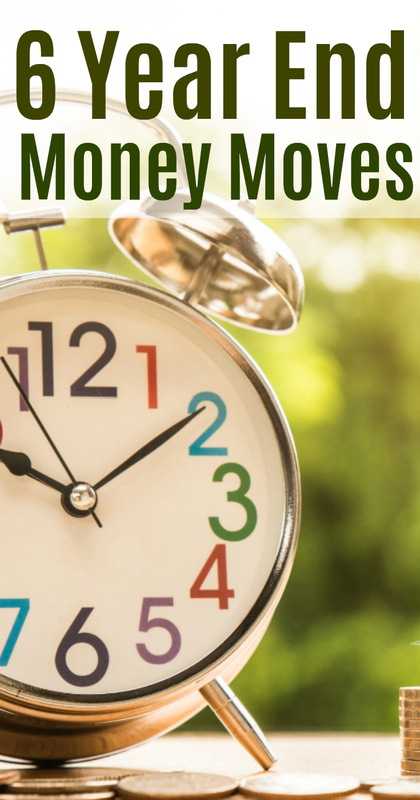 Here are 6 year end money moves to make to give you peace of mind as we roll into the New Year. The most you can invest through your employer is $18,000 a year, or, $24,000 per year if you are 50 or better. If you haven’t hit that amount, you may want to consider increasing your 401K contribution in December to meet that yearly limit. Talk to your Human Resources and let them know you want extra taken out of your last paycheck this year, or consider sending any yearly bonus that you receive straight to your 401K. It’s always best to make sure you can manage to send that extra to your 401K. You don’t want to blow your budget on behalf of an extra contribution. Your retirement doesn’t stop with your 401K. If you are fortunate enough to max out your 401K contribution, then stuff extra into your IRA. There are two types of IRAs – a traditional and a Roth. You’ll want to make sure you are familiar with each type and find out what’s best for your situation. You can put away $5,500 per year in your IRA – or, $6,500 if you are 50 or better. It’s best to talk to your investment advisor to find out the best route to take. Just six months after your turn 70, you are required to take out money from your retirement accounts – whether it be a 401K or an IRA. The IRS dictates that minimum distribution. If you forget and don’t pull it out, then you are penalized. That penalty is pretty large – a whopping 50% of the money you didn’t take out. You don’t necessarily need to spend it once it’s out, so if you can, just find a place to let it sit – like a savings. Chances are you have a mountain of clothing and other materials at home that can be dropped off at the homeless shelter, library, or thrift. Make an effort to get this done before 12/31. If you are making large donations, grab a receipt for donations valued at $250 or more. Not only will it help your tax liability, it ‘s a great way to start the New Year off on the right foot with less clutter and a better plan to get organized. Having a will is one of the most important things you could do right now to take care of your family. If you don’t have a will, you might want to think about investing the time to take care of putting one in place, especially if you have kids. Your will can protect your spouse, children, and assets. It will also pinpoint exactly how you would like to have things handled after you pass. If you don’t have one, make a point of putting one in place before year end. If you already have one, take time to review and make any needed updates (adding children, etc.) before the start of the New Year. If you are saving for your child’s college expenses, a 529 plan contribution can be a wonderful way to reduce your state tax liability. However… like other investment vehicles, you will have to make those last minute contributions before April. I like to make any and every attempt to do it by year end though – at least for me, my mind can wrap around a calendar year easier. Plus it allows me to start the new year fresh and clean with goals for greater contributions for the next tax year. One of the best avenues to take before year-end is that of sitting down with your financial advisor, or tax professional. After discussing these year end money moves with your spouse, it’s almost a necessity to put them into action with that professional. Not only will it be a step in the right direction before the New Year, it’ll give you peace of mind as the current year comes to a close. Do you try to focus on any of these year end money moves as the year draws to a close?